My favorite shopping moment of the year is shortly before Christmas when you are just about to plan your festive outfits and when you buy the last (or first ;)) Xmas presents and the big winter sale starts! 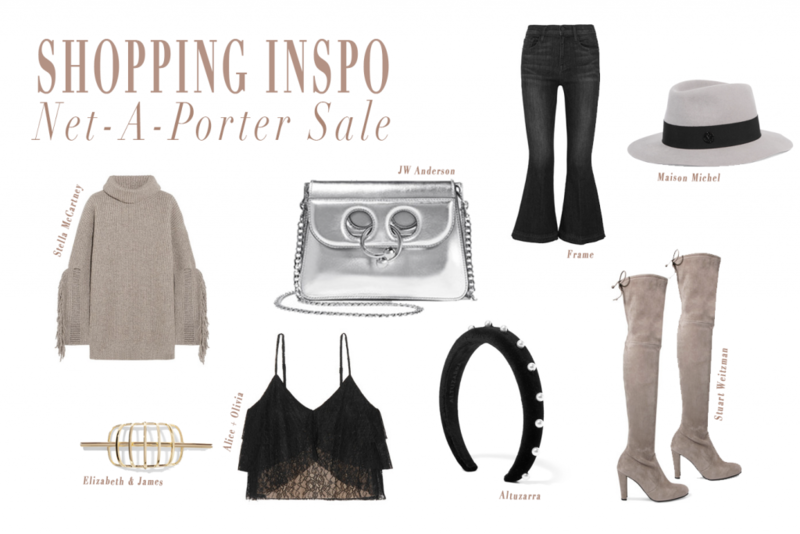 Today was the beginning of different fun sales such as the Net-A-Porter sale! As I just went to a NAP trip (read all about it: here), I know the assortment quite well and wanted to share some sale bargains with you – Especially since markdowns of up to 50% are auch a good deal when investing in a designer piece such as a JW Anderson Pierce bag! Below you can find the images of some of my favorite sale finds, but I also wanted to tell you more about my absolute fav picks! Firstly, my all time favorite Stuart Weitzman overknees are on sale, even in the most beautiful light grey shade! I bought exactly the same ones last year and they are the best to combine during autumn and winter! When you are looking for overknees boots, I also love the aubergine colored ones by Stuart Weitzman or navy flat ones! As I’m collecting huge, chunky knit sweaters I also have an eye on a turtleneck Stella McCartney one! Moreover, I’m still looking for white ankle boots and my top two are from Proenza Schouler or Dorateymur. I also linked some very Christmassy pieces such as glitter bow ankle boots, velvet mules or pink velvet sandals! And as I love my JW Anderson Pierce bags, I can also recommend the most beautiful velvet one or a silver model which works for Christmas AND NYE! It’s just the beginning of sale so I’ll keep on updating my boutique to share with you all my favorite new sale finds! What’s on your Xmas wish list? Don’t like the pants. Not a big fan. But the rest is lovely! Toller Beitrag und tolle Inspiration! Schuhe sehen super dazu aus, hätten wir nicht anders kombiniert!